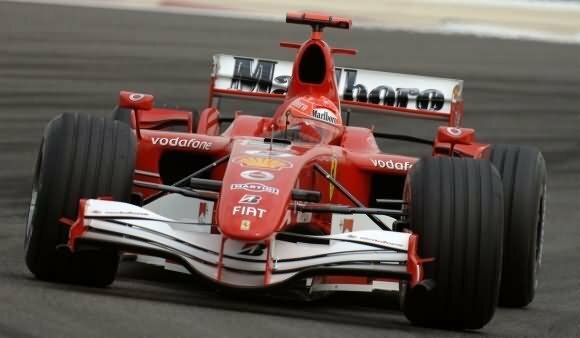 Ferrari F1 has been launched with the hope that the car would bring much needed victories to Ferrari in F1 circuit this year. We hope that the new car surely ushers in good luck. One of the main aims in designing this car is to get more power on the road without putting an extra load on the wings and consuming more fuel. The frontage consists of rear view mirrors which are mounted on small turning vanes infront of the sidepods. The sidepods are also given aerodynamic shape. The car has been provided a long wheel base which drastically affects the weight distribution because of the enlarged fuel tank. The nose of the car is much long and high. The rear wing consists of a big Santander logo. The car has narrow front tyres keeping in view the aerodynamic aspects. The main body of Ferrari F1 is very narrow in order to free up airflow over and under the large diffuser. The part of the car behind the driver’s back is big in order to accommodate the fuel tank. Some more space is made from the area of the airbox. The car has fully integrated floor/double deck diffuser combination. Ferrari F1 has maximized ancillary packaging, like, fuel pumps and hoses. The red and white colored sports car hopefully proves lucky.